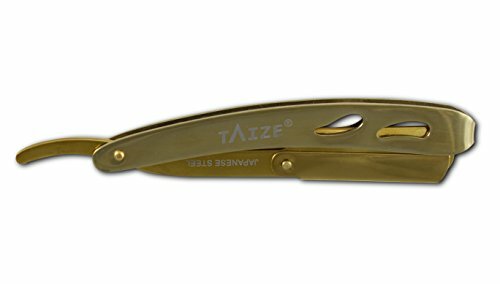 DURABLE, STAINLESS STEEL DESIGN - With a TAIZE® Straight Razor in your hand you will feel the difference immediately. Each razor is designed to have a balanced weight that provides a perfect equilibrium between the handle and blade making shaves effortless. From the sleek and comfortable designs, made from high quality Japanese Stainless Steel, to the most affordable prices, TAIZE® has everything you need to make your shaving experience as smooth and clean as possible. STRAIGHT RAZOR USE - Unwrap the blade by peeling back each side of the wrapper carefully. Then open the wrapper and take a half-blade and separate two parts of the razor, set the half-blade in between the two parts and push the back to lock it in place...that's it! With Taize® Straight Razors you will experience the classic feeling of a professional shave just like your grandfathers! There are many options for disposable razors, but none come close to the feeling of a classic shave from a Straight Razor. QUALITY STEEL: Our Straight Razors are made of the finest quality Japanese Stainless Steel and are guaranteed to never tarnish or rust. High quality pins are used to make the blade guard easy-to-open and the replacement of blades effortless. COMFORTABLE: Each razor is designed to have a balanced weight that provides a perfect equilibrium between the handle and blade making shaves effortless. The tang is shaped perfectly to fit in your hand and to reduce discomfort. PROFESSIONAL: Our Razors are made for professional barbers and the like. Equip a new blade and go! Each blade (sold separately) can be used for 2-3 shaves. TAIZE® Straight Razors are guaranteed to withstands all types all types sanitizing products. 100% SATISFACTION: We know you'll love our products and come to enjoy a timeless, classic shave, but we offer a risk free 30-day Money Back guarantee on all of our Straight Razors. If you don't love your clean shave simply send the product back and your money will be refunded. View More In Straight Razors. If you have any questions about this product by Taize, contact us by completing and submitting the form below. If you are looking for a specif part number, please include it with your message. New Straight Edge Stainless Steel Barber Razor Folding Shaving Knife WOOD 9 5/6"